The core teachings and practices of Buddhism are systematically directed toward developing keen and caring insight into the relational or interdependent nature of all things. 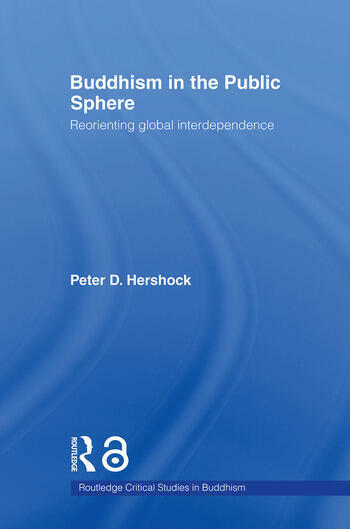 Hershock applies Buddhist thought to reflect on the challenges to public good, created by emerging social, economic, and political realities associated with increasingly complex global interdependence. In eight chapters, the key arenas for public policy are addressed: the environment, health, media, trade and development, the interplay of politics and religion, international relations, terror and security, and education. Each chapter explains how a specific issue area has come to be shaped by complex interdependence and offers specific insights into directing the growing interdependence toward greater equity, sustainability, and freedom. Thereby, a sustained meditation on the meaning and means of realizing public good is put forward, which results in a solid Buddhist conception of diversity. Hershock argues that concepts of Karma and emptiness are relevant across the full spectrum of policy domains and that Buddhist concepts become increasingly forceful as concerns shift from the local to the global. A remarkable book on this fascinating religion, Buddhism in the Public Sphere will be of interest to scholars and students in Buddhist studies and Asian religion in general. Peter D. Hershock is Coordinator of the Asian Studies Development Program at the East-West Center in Honolulu, Hawai'i. His research interests focus on the philosophical dimensions of Chan Buddhism and on using the resources of Buddhist thought and practice to address contemporary issues. He is the author of several books and articles on Buddhist Philosophy and Chinese Religion and Philosophy.